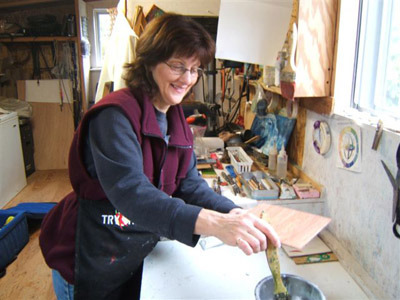 we share her love for the art of encaustic art. 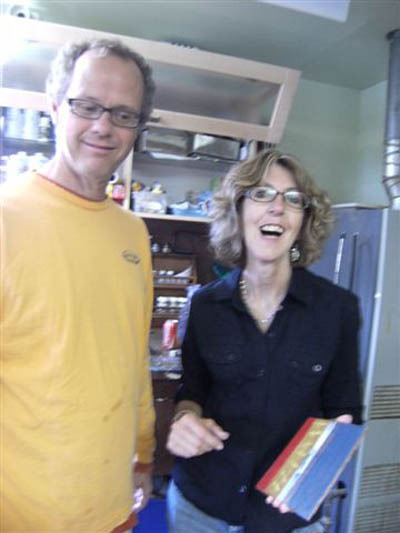 A loving mother to Darren and Grandmother to Grayson, Lois’ life crossed many cities across western Canada. 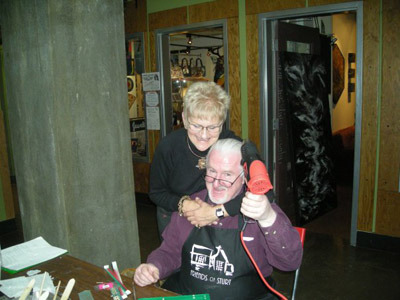 Lois shared her colorful and love-filled personality and light in Calgary, Canmore, and Brentwood Bay, to name only a few. 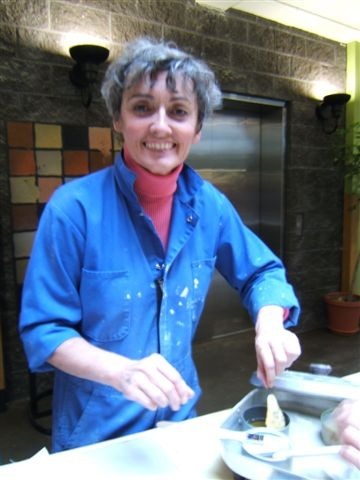 Her journey included many different forms of creative outlets, but her favorite and most passionate was encaustic art. 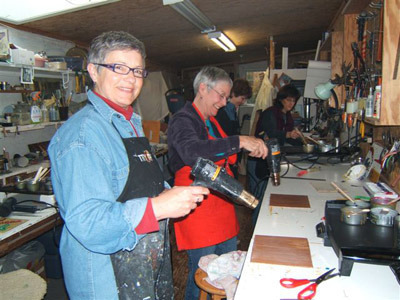 With pets at her side, Lois made her way out behind her Saanichton home to her workshop to create. A wonderful sunlit studio, that was the home of so many of her creations. 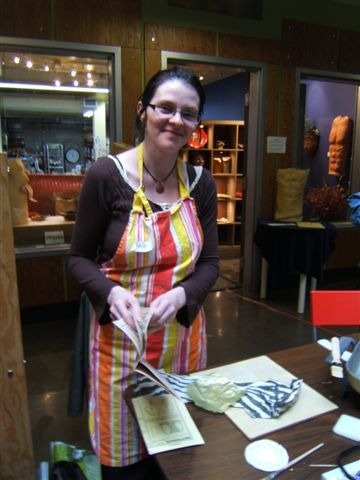 She shared her love for art, and encaustic in particular, with so many art students on the west coast. 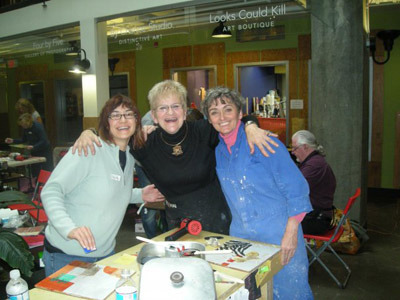 Hosting learning workshops, Lois kept her students close like family, and was even more proud of the art they created together. 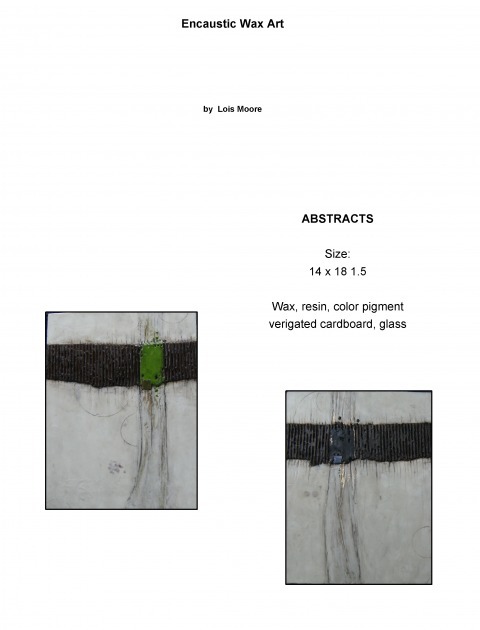 An innovative and versatile artist with a talent in many mediums, Lois Moore’s work evolved over the years and took her in many fulfilling directions. 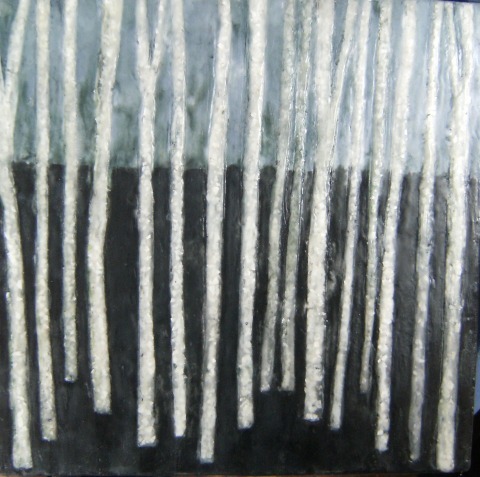 Glass, sculpture, textiles, water fountains, jewellery designer, and finally Encaustic art. Lois had painted since a teenager and was basically self taught with the help of a few workshops over the years. 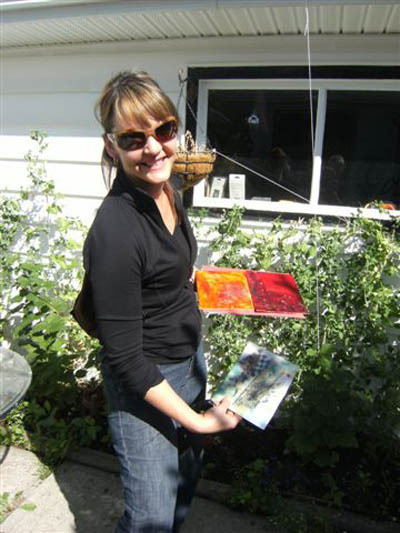 It wasn’t until her move to Victoria in 1999 that she decided to pursue her dream of being a full time artist. Her thirst for knowledge combined with her curious nature for experimenting expanded her creativity and resulted in some unusual art lines. 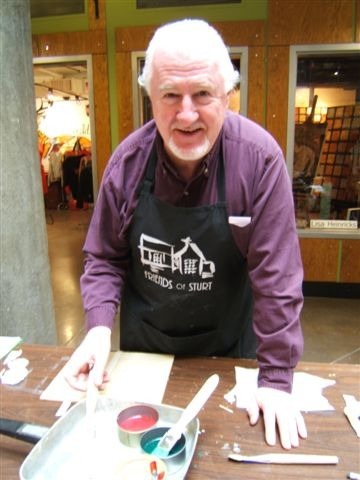 Working with Encaustic requires a quickness, decisiveness, and willingness to both predetermine and create images as they happen. 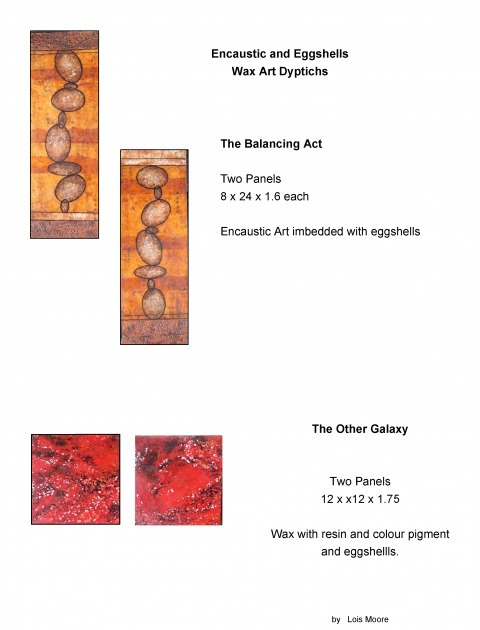 Beeswax is used with damar resin and pigment, then applied on a board with heat applied from various tools to produce magnificent luminous colours and dramatic textural effects. 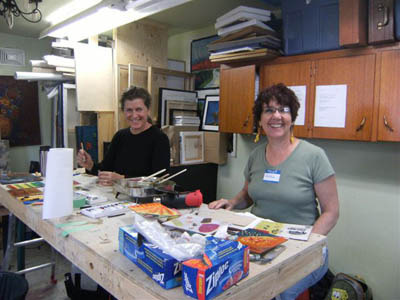 Lois, was a self motivated passionate artist open to exploring new techniques as well as creating a few of her own, recently took her Encaustic training in San Francisco. 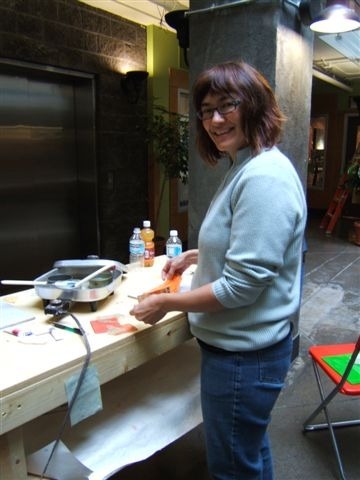 Lois’ work shows and sells in art shows and galleries in Alberta and British Columbia. Lois Moore passed away from an undiagnosed heart condition while on vacation in Puerto Vallarta Mexico, in August 2009. 1. painted with wax colours, fixed with heat. 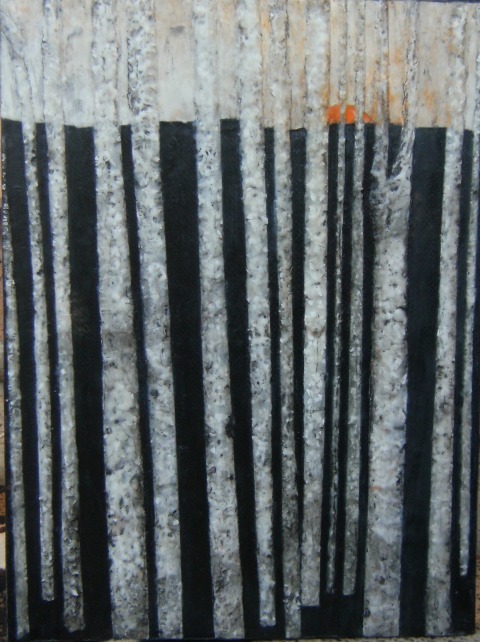 2. a work of art produced by an encaustic process. This 2,500 year old art form was used by the ancient Greeks, Egyptians and Romans. When heated, colored waxes were used to decorate the walls of tombs. 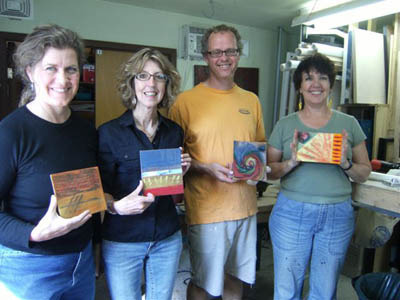 Encaustic means “burn in”. 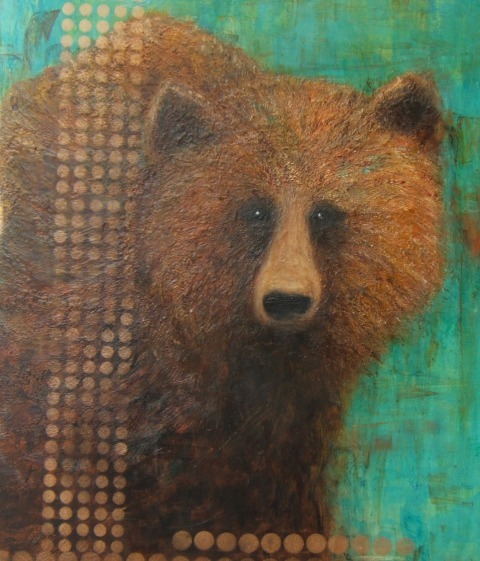 It utilizes Beeswax mixed with pigments and resins as a lightfast painting medium. 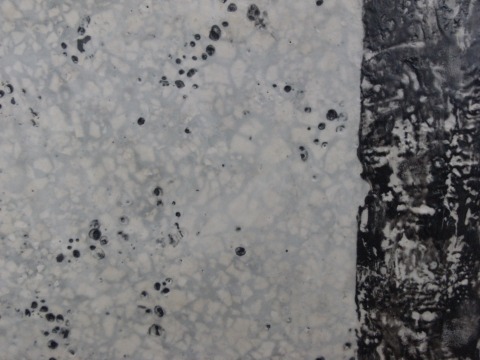 This medium is usually painted with heat from an iron, hot stylus, brush or air gun. 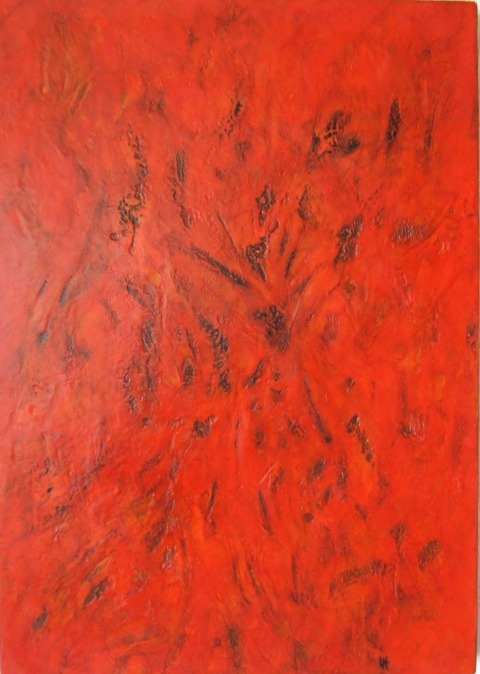 The layers of wax are fused with heat as the painting progresses and the colours resulting are rich and luminous. 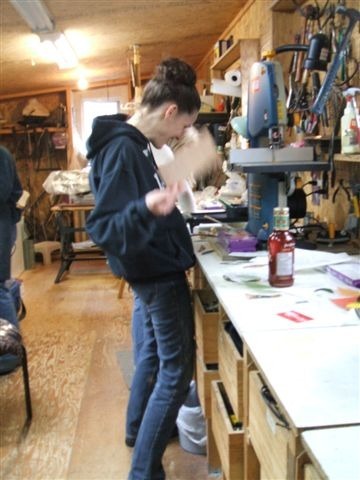 The wax dries immediately after the heat source is removed. 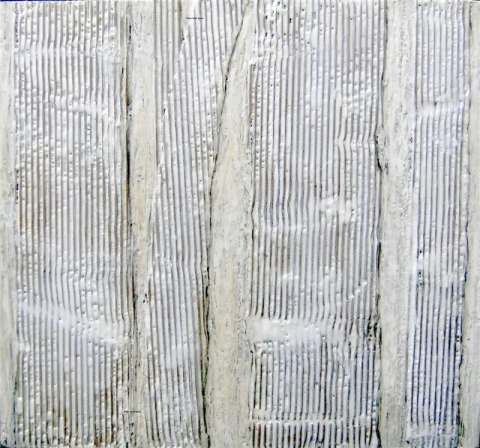 Polishing with a soft cloth brings a beautiful gloss to the image which has a smooth or raised texture achieved by the techniques employed. 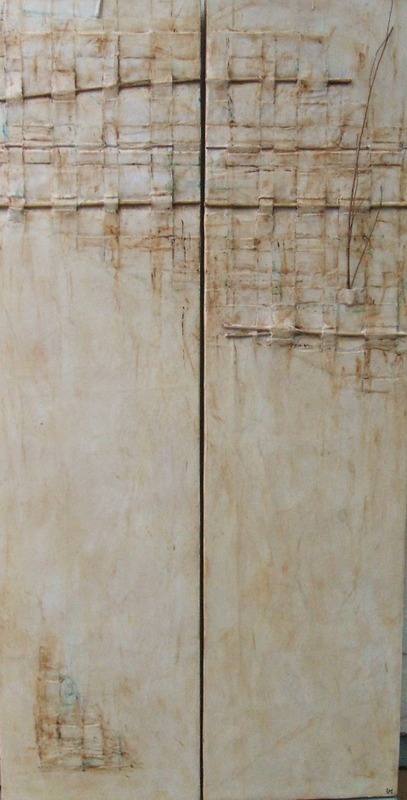 Encaustic paintings are perhaps the most durable form of painting, evidenced by the Faiyum mummy portraits which have survived over 2000 years without cracking, flaking or fading. Wax has several inherent qualities that allow it to withstand the test of time: it is moisture resistant, mildew and fungus resistant, and unappetizing to insects. The wax paints do not contain linseed oil which could darken with age, or poppy oil, which can crack over time. 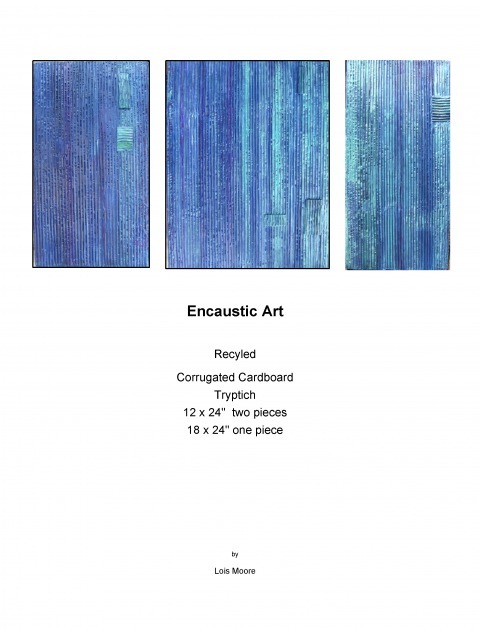 Ultimately, encaustic paintings have survived the ages because their paint film successfully seals out moisture, acids, dirt and atmospheric gases. The finished painting can never be copied exactly, no matter how skilled the artist, so each painting is a true original that can never be repeated. Working with encaustic requires a quickness, decisiveness and willingness to both predetermine and create images as they happen. 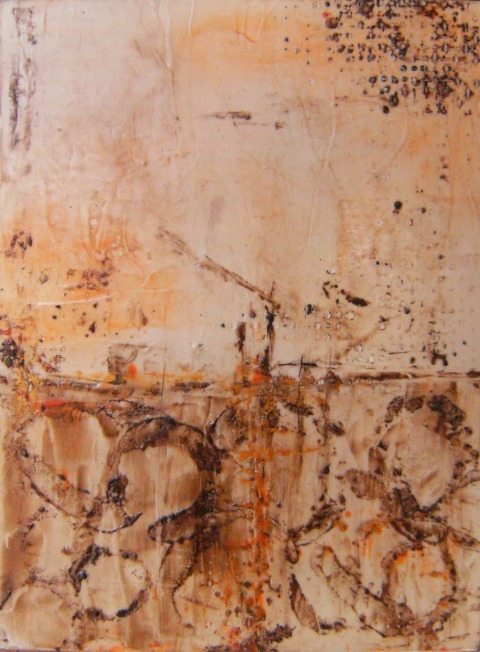 The 20th Century has seen a rebirth of encaustic on a major scale. 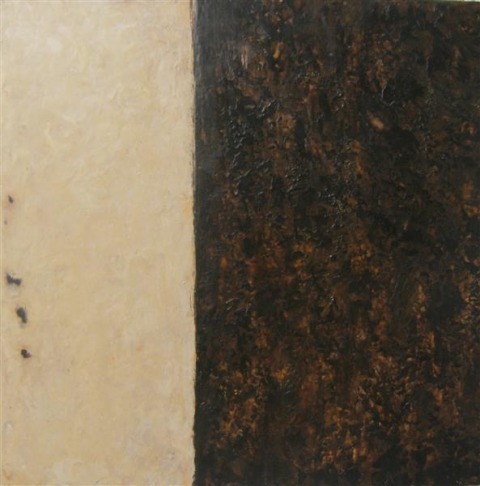 It is an irony of our modern age, with its emphasis on advanced technology, that a painting technique as ancient and involved as encaustic should receive such widespread interest.